MAALAEA — Hundreds of humans got up close and personal with Hawaii’s most beloved mammals Tuesday night during the unveiling of Maui Ocean Center’s $3 million “Humpbacks of Hawaii” exhibition and sphere. Larger than an average adult whale, the sphere plunges audience members beneath the sea to view virtual, proportional humpback whales in their home environment. Approximately 650 people showed up to preview the exhibit and sphere before it opens to the public Feb. 10, center representatives said. 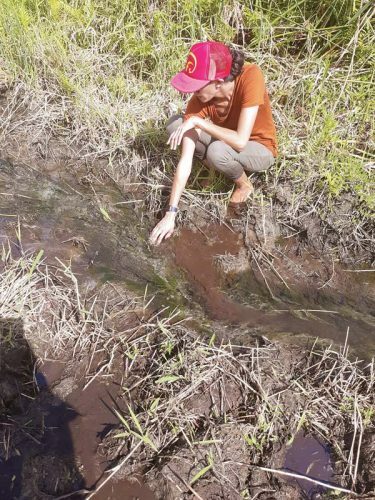 Donna Weikert of Ohio, who spends part of her year on Maui, said the experience was realistic. “You do want to reach out and touch it,” she said. Preview participants enter Maui Ocean Center’s new exhibition hall during the “Humpbacks of Hawaii” premiere Tuesday evening. The hall, which leads to the center’s state-of-the-art sphere, features interactive learning stations including a make-your-own whale song. 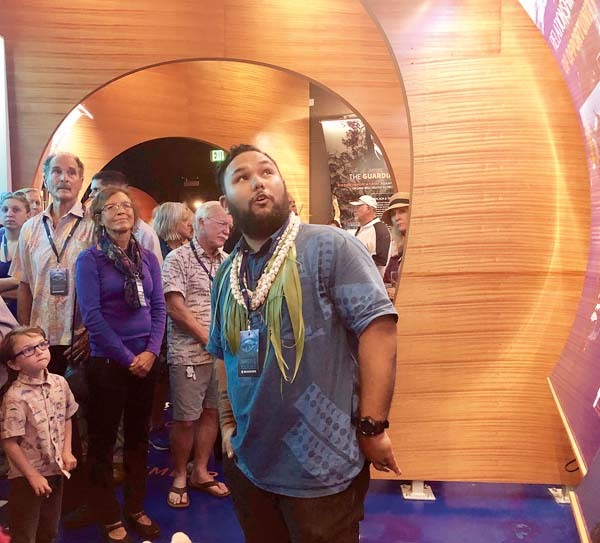 Humpbacks of Hawaii includes a hall with interactive learning stations, a 25-foot convex screen and a 118-seat sphere that features a 3D underwater experience by filmmaker Daniel Opitz of Ocean Mind. Hailed by center representatives as the first of its kind in Hawaii, the sphere uses advanced visual and audio technology. Participants wear 3D glasses to view 4K resolution, laser-projected imagery against a concrete, single-slab dome that’s 58 feet in diameter. 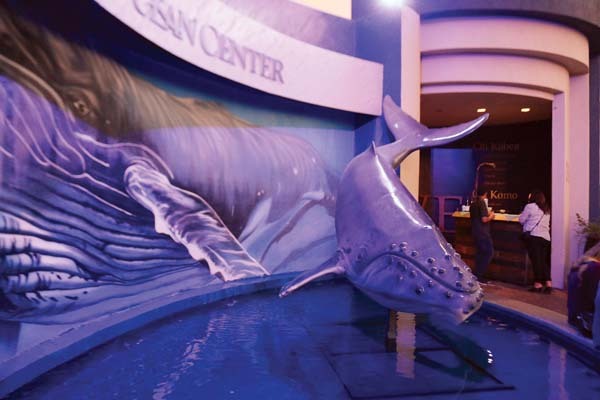 The approximately 15-minute screening, which employs “some of the most advanced systems in lenses and seaming technology,” brings proportional whales to life for exhibitgoers, “just as if you were underwater with them,” center representatives said. General Manager Tapani Vuori said the technology does not exist at this level in any aquarium in the nation. “There’s nothing like it,” he said Tuesday night. Filmed and produced by Opitz, the whales featured in the sphere were documented in Maui waters over two seasons under National Oceanic and Atmospheric Administration permitting and supervision. 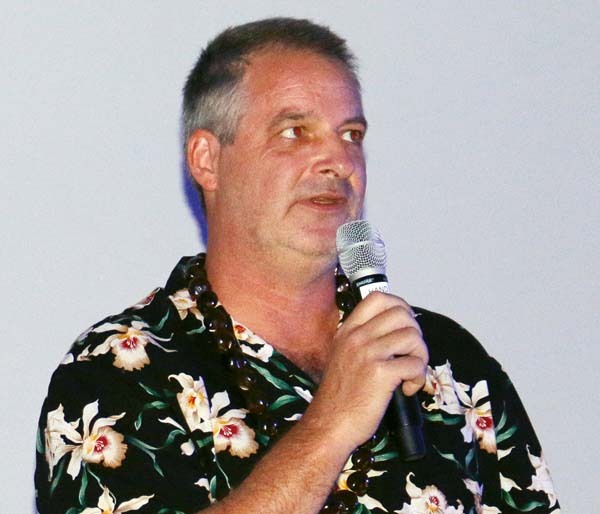 Daniel Opitz of Ocean Mind, “Humpbacks of Hawaii” filmmaker, gives the opening speech at the first of six screenings during Maui Ocean Center’s premiere of the film and venue. “The rate of the film made you feel comfortable,” he said. The sphere is intended to also be used as a community resource for corporate events and educational talks, such as a celestial classroom for immersion schools, Opitz said. Vuori said in June that the theater and adjacent 1,200-square-foot exhibition space were expected to cost less than $10 million. Focusing on the whales’ nomadic lifestyle and migration routes, the hall highlights humpbacks’ nearly 6,000-mile round-trip journey from the Arctic seas to Maui’s warm waters each year. It also depicts whale behavior during traveling, eating and playing. A make-your-own whale song option, along with other interactive stations, give participants hands-on learning opportunities. Humpbacks of Hawaii was created in collaboration with local artisans, marine mammal specialists, NOAA and affiliated organizations. Ultimately, Vuori said, he hopes viewers will learn that with great resources, come great responsibility. Maui Ocean Center, a 3-acre marine park, opened in 1998. It features live Pacific corals, more than 60 exhibits, 20 daily presentations by marine naturalists, outdoor tide pools and a 750,000-gallon Open Ocean exhibit. This latest expansion opens to the public Feb. 10, with the following prices that include aquarium admission and “Humpbacks of Hawaii” screening: $34.95 adults, $31.95 seniors and $24.95 children. For more information, visit mauioceancenter.com. 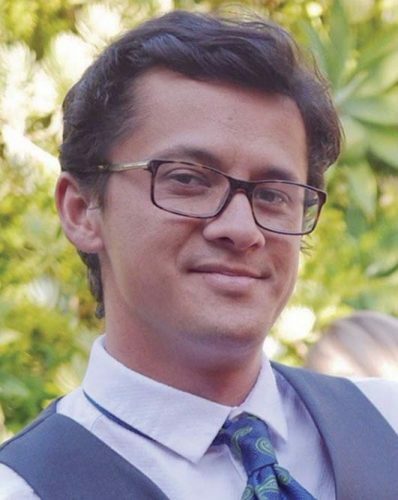 ** This story includes a correction from the original published Wednesday January 30, 2019. The Lunas’ Abby Akamine puts up a shot as Thornton defends and the Sabers’ Hiilani Arai and Honey Let Padasdao look on. Lahainaluna’s Ashley Akamine goes to the basket against Maui High’s Kayla Thornton on Tuesday. Thornton and Arai defend against Lahainaluna’s Piper Pascua. Shelley and Ikaika Blackburn (from left), one of the families who organized the Lahaina Strong Benefit Concert in October to benefit Lahaina fire victims, pass out donations of $5,000 each to the affected families at Lowe’s in Kahului on Monday evening. 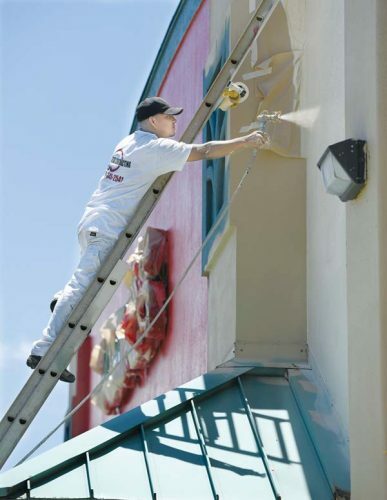 The families may use the money for their Lowe’s purchases. Accepting the donation is Yolanda Dizon. In the back is Joseph Aquino, who also received a donation.